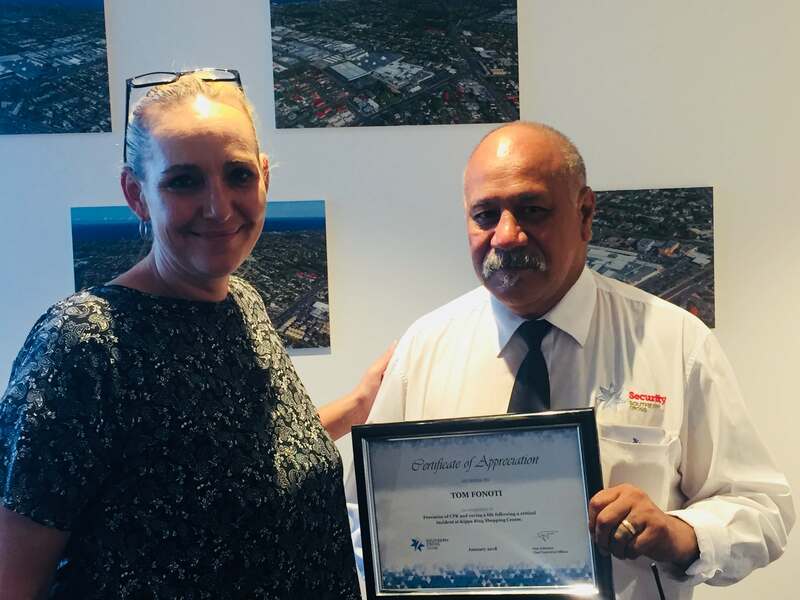 Jennifer Spratling (Kippa Ring CM – QIC) presenting Tom Fonoti with an Appreciation Award in recognition of “Provision of CPR and saving a life following a critical incident at Kippa Ring Shopping Centre”. Tom Fonoti’s instinct and calm response helped to save the life of a young man. Tom is one of our outstanding Security officers at Kippa-Ring Shopping Centre. Tom showed great observation skills and lateral thinking when he noticed conflicting red and green lights on a disabled toilet door. After knocking on the door repeated with no response, Tom requested the assistance of his Supervisor and they gained access into the disabled toilet where they found a man unconscious on the floor – his lips had turned blue and he had no pulse. Without hesitation, Tom cleared the man’s nose and mouth from bodily fluids and began CPR until the Paramedics arrived. Tom’s quick response led to the young man being revived and then transported to hospital. We thank Tom for his quick thinking, calmness and brave approach. Well done Tom and Congratulations!! !